The director and star of 2003’s inept cult classic melodrama The Room is an enigma, and purposely so. Much has been reported over the years of the mysteries surrounding the man: where he’s actually from, how old he actually is and how he actually managed to scrape together The Room’s oft-cited $6 million budget. Some of these mysteries had answers hinted at by The Room co-star Greg Sestero’s (and Tom Bissell’s) 2013 book, The Disaster Artist, which is the basis of James Franco’s new film. The truth of the matter is that the uniqueness of Tommy Wiseau extends far beyond superficial observations of “this guy looks weird” or questions like “what kind of accent is that, anyway?” He’s so much stranger than just that, infusing his films with a personal mix between weirdness and sincerity that has made The Room into this generation’s Rocky Horror Picture Show. To tackle the ineffable mystery of Wiseau’s consciousness is to understand the mind of a crocodile, or of a shark, or of a space alien. I wouldn’t even know where to start. Which is precisely what makes James Franco’s portrayal of Wiseau in The Disaster Artist such an impressive and triumphant one. Franco has physically transformed into Wiseau in the same manner that usually draws praise for an actor such as Daniel Day Lewis: not necessarily via hair or makeup, but in a way that is more primal and intimate. Every odd little tic, every awkward laugh, each inexplicable grimace—the gestures all shine through as genuine to anyone who has seen The Room, or even an interview with Wiseau. The portrayal is a huge part of what makes The Disaster Artist so compelling and just plain fun. You could make a good argument that this is the greatest role of Franco’s career. The Disaster Artist takes place in the late ’90s and early 2000s, amusingly captured with movie posters for the likes of Thirteen Ghosts and Ready to Rumble, as a young Sestero (Dave Franco) first meets the outlandish Tommy Wiseau in a San Francisco acting class. Drawn to the stranger’s lack of self-doubt, overt confidence and fearlessness as a performer, Greg finds himself taken under Tommy’s wing in a friendship that feels like a bizarre cross between younger brother and nubile au pair. Greg’s very presence seems to have an energizing effect on Wiseau that is both concerning and complex; his modest successes as an unknown actor gives Tommy equal pride and intense jealousy, while simultaneously pushing him to accomplish something for which the world will remember him. That drive eventually manifests as The Room, which to Tommy represents the opportunity for dramatic excellence Hollywood will always deny him as an outsider. Here, the film diverges somewhat from the story Sestero tells in the source material. In reality, Greg was never meant to play the film’s second male lead, Mark. In fact, he was supposed to be a line producer, keeping track of all the bodies on set, before Wiseau decided that he was displeased with the actor portraying Mark. 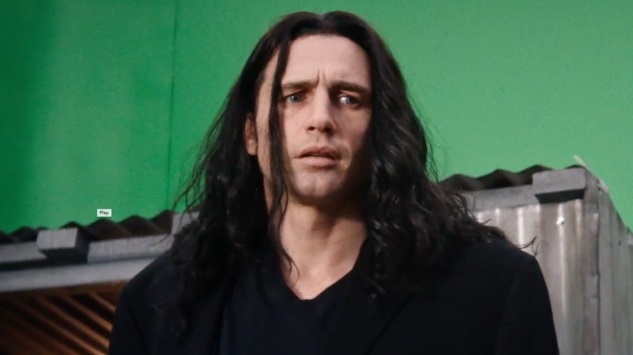 Being the passive-aggressive madman that he is, Wiseau didn’t just simply make the switch—he began reshooting Mark’s scenes with Sestero before bothering to fire the original Mark, telling the actor he’d originally cast that Sestero’s scenes were simply “rehearsals” and acting practice. This went on for days before the original Mark was finally fired from the production. That story is cut from The Disaster Artist the movie, along with a number of others, largely to serve the narrative that Tommy was (and is) a genial, if bizarre, kind of guy. Yes, some sequences portray him as deluded, uncomfortable to be around and verbally abusive, but Franco’s Tommy pales in comparison to the portrayal in Sestero’s book, which at times all but labels Tommy a manipulative sociopath. Though, reading it, you certainly don’t feel like this naive kid’s otherwise promising career was derailed by his association with Wiseau, either. Tommy may be the bane of Greg’s existence to some degree, but he’s also his golden goose, because, let’s be real, nobody would ever have known Sestero’s name if not for Tommy. The two need each other, and they both know it, which is exactly why we’re finally getting them reunited in the film Best Friends in 2018. It was written by Sestero, by the way. As for the cinematic The Disaster Artist, outside of its magnificent central portrayal by the elder Franco, its strongest and occasionally most problematic elements revolve around the huge ensemble cast of familiar faces. This film is like Hollywood’s own The Room viewing party, loaded down with so many notable names that it sometimes comes off too winkingly parodic, as if the playlet from Thor: Ragnarok ran throughout the entire film. Some roles reek a tad too smugly—look at Josh Hutcherson’s face in a horrendous-looking wig, playing Tommy/Johnny’s neighbor Denny, for example—but other performers shine in roles that allow them to interact with Franco/Wiseau as straight men baffled by the perplexity of what’s going on around them. Seth Rogen and Paul Scheer, in particular are both hilarious, playing the film’s script supervisor and original director of photography, respectively, grappling with demands that are often outside the realm of understanding. Rogen alone has about half the film’s biggest laughs—is that not what you would expect for someone whose daily job on set is to interpret the will of Tommy Wiseau’s script for The Room? No wonder he assumes his checks are going to bounce. In the end, The Disaster Artist reads like it’s positioning for a shot at year-end honors and the largest possible audience, but fans of The Room will ultimately get far more from the experience than the average multiplex dweller. It’s a film to see with an audience familiar with what it’s about to see, with people who can appreciate the dedication with which Franco and co. have recreated so many of the original film’s woeful scenes and performances. This is also what will ultimately place it a notch below Ed Wood in the pantheon of good movies about terrible movies: The Disaster Artist may faithfully (very faithfully) recapture the spirit of The Room, but it’s less welcoming to those who have never hurled a plastic spoon screenward at a midnight showing. So do yourself a favor: Before seeing The Disaster Artist, go (out to) see The Room. Only then will you be able to appreciate the style with which Franco has pulled off one of the year’s best performances. Jim Vorel is a Paste staff writer who has probably seen The Room several dozen times at this point. You can follow him on Twitter for more film writing.